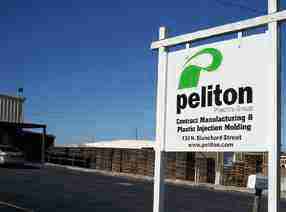 What is the definition of the word Peliton? Peliton is a term that is used in bicycle racing. It means a team of highly motivated individuals working together to accomplish a common goal. In bicycle racing it is when the team joins together in close formation drafting on one another to power though the air resistance toward the finish line. In manufacturing it is our team working closely with your team overcoming any adversity to bring your product to market. It is a process of forming a thermoplastic material into a desired shape that requires a machine and tooling (also called mold or die). Clamping - The press closes the two halves together with great force to withstand the pressure of the molten compound. Injection - During this phase, raw material usually in the form of pellets, are fed into the cylinder where they are heated until they reach a molten form. As they are being melted, they are worked to the front of the cylinder by a rotating screw/plunger. When a "shot" has been made in front of the screw, it moves forward to inject the compound into the empty cavity. Holding - This is the last step in forming the part; the machine "holds" the material under pressure until it can solidify. Cooling - This is the time that the part cools to its solid form, during this time the screw in the unit begins to rotate to build the next "shot". Mold Open - The clamping unit is opened, which separates the two halves of the form. Ejection - The clamping unit has an ejection plate that physically connects to the ejection system that is designed into the mold. It strokes forward to eject the finished part. The cycle is complete; return to step #1. What will the tooling cost be for my part? Tooling cost depends on several factors, how complex is the part, how many parts per cycle, how big is the part, how many parts are required to make your product? Also how long will the tool need to last? This determines what type of material will be required in the tools construction, (aluminum or steel). How fast do you need it? All of these factors come into play on tooling cost. Here is an example; we built a mold for our "flying disk", (our promotional products line). It makes one 9.5" disk, tool steel, and no rush -- ten thousand dollars. But DO NOT lose hope; just about every thing that you see in the world today is made from some form of plastic parts. You need a good prototype, maybe some investors, and a good marketing strategy. Inventiveness and creativity has gotten you to this point, so don't stop now. Click to view more custom made plastic products. Plastic was first invented in Birmingham, England in 1851 by Alexander Parkes. Parkes named the new material "Parkesine". Parkes demonstrated that the material could be melted, formed, and would retain its shape once cooled. However, Parkesine was expensive, fragile, and highly flammable. John Wesley Hyatt, an American inventor, made a new form of material he called Celluloid in 1886. Celluloid was patented in the United States in 1869. Hyatt went on to invent and patent the first machine in 1872. This machine was relatively crude compared to modern machines. The machine used a plunger to inject the molten material into a form. Some of the first products produced using this new system were billiard balls, collar stays, false teeth and piano keys. During World War II the industry expanded rapidly due to the demand for inexpensive, mass-produced products. In 1946 American inventor James Watson Hendry built the first screw type injection machine. Hendry's new machine allowed precise control over the speed of the process and the quality of the products produced. The machine also allowed color and other additives to be added and mixed in with the material before being injected into the form. 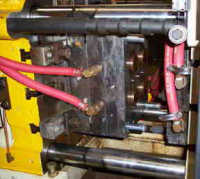 The screw type machine is still in use today.